Should the ongoing Khmer Rouge Tribunal have its scope expanded? One of its judges seems to think so. When international negotiators began the arduous task of thrashing out the makings of the Khmer Rouge Tribunal, certain considerations were made. It was decided the entire emphasis of the trial would rest solely on crimes committed in Cambodia between April 17, 1975 and January 7, 1979. This was the period when Pol Pot and his Standing Committee, an inner circle who terrorized their countrymen and obliterated Khmer culture, spawned the term auto-genocide. Conveniently, however, the decision meant the tribunal would be strictly a Cambodian affair and the wars waged before and after Khmer Rouge occupation would be dismissed. As such, the likes of former U.S. Secretary of State Henry Kissinger, Vietnamese leaders in Hanoi and their Soviet backers would be insulated from the tribunal’s reaches and Cambodian war crimes committed outside the mandated time frame deemed largely irrelevant. 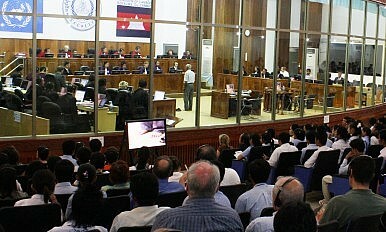 In other words, the Extraordinary Chambers for the Courts in Cambodia (ECCC) is very much a Cambodian affair with an endorsement by the United Nations, which has long since compromised its moral clout in this country by continuing to recognize the Khmer Rouge as legitimate head of state way after they were run out of town and their crimes laid bare. The ramifications are striking when held against the unending politics and bickering between international and local staff and opinionated observers with a view from the moral high ground that has dogged the tribunal since its formal inception in 2006. Now, one international judge has upped the ante and declared he has begun fresh investigations into Case 003, without the support of his Cambodian co-investigating judge. Swiss Judge Laurent Kasper-Ansermet – also known as the “Twittering” Judge for a predilection towards leaving legal comments on the social networking site – has the backing of the United Nations amid a dispute with the Cambodian government, which has refused to recognize his appointment. Kasper-Ansermet, some would argue, appears to be doing as he likes without regard for the Cambodians about whom this tribunal is all about. Arrogant foreigners doing as they please have been a common gripe among Cambodians for centuries. Kasper-Ansermet was named to the ECCC after the colorful German judge Siegfried Blunk quit the tribunal last year to protest what he said was Cambodian interference in judicial matters, in particular whether or not further prosecutions should proceed. Much of his frustration centered on Cases 003 and 004, which have remained in a legal Never Land since they were effectively struck down by judges in April last year amid well-documented opposition from politicians. Chief among them was Prime Minister Hun Sen, leading to another round of indignant objections from pouting human rights groups and Non-Governmental Organizations. In Case 003, Meas Muth, the Khmer Rouge navy commander, and Sou Met, the air force commander, were targeted for genocide and crimes against humanity. The Khmer Rouge air force and their navy were hardly capable organizations and held little strategic importance; however, both men have been linked to construction of a giant airstrip in Kampong Chhnang where thousands perished during its construction. Evidence already heard at the tribunal and documented at length by The Diplomat in December portrayed life around the 1.4 kilometer Chinese-backed strip as a grisly struggle for survival where workers often preferred suicide to the miserable conditions they toiled under. Meas Muth is also believed to have played a primary role in the arrest and deaths of foreign yachtsmen – four Americans, two Australians, an Englishmen, a New Zealander and a Canadian – who strayed into Cambodian waters. Both Meas Muth and Sou Met received their orders directly from Pol Pot – who died 14 years ago – or his trusted second-in-command Nuon Chea. Both men allegedly sat on the Security Committee that was responsible for sending thousands upon thousands to their deaths. Currently, Case 002 is being heard and Nuon Chea as recently as last week again told the court he hadn’t been responsible for the rampant slaughter that became synonymous with the Khmer Rouge. Orders were often carried out at the regional level and international prosecutors at the ECCC also wanted to prosecute other regional officials in Case 004 – Im Chem a former district chief in Banteay Meanchey province and deputy zone secretaries, Yim Tith and Aom An. 1998 is that 33 years after their reign ended there are probably hundreds, maybe thousands, of former cadre with a case to answer. But whether that warrants a hearing in the ECCC is another matter. The ECCC has been tasked with putting those most responsible into the dock – widely accepted as the surviving members of the Khmer Rouge Standing Committee. These people – Nuon Chea, Khieu Samphan and Ieng Sary – wrote and deployed government policy in the Democratic Kampuchea and are now before the court in Case 002. Doctors have found Ieng Thirith, wife of Sary, and former minister for social affairs, medically unfit for trial. Whether the definition of what constitutes “most responsible” for the deaths of up to 2.2 million people should be extended to include district officials is an important point. Additionally, the further investigators descend down the ranks, the closer they get to the very people who made the tribunal possible in the first place. Much has been made of the fact that Hun Sen and his political peers Heng Samrin and Chea Sim were all former Khmer Rouge. So what? They also defected once the scale of the barbarity became apparent, helped the Vietnamese to engineer an invasion and Pol Pot’s ousting from power, and save some of the U.N.’s moral bacon by going cap in hand and asking for the tribunal. None were among the “most responsible” for Khmer Rouge crimes. One also hopes the likes of Kasper-Ansermet have deep pockets. To date, Case 001, which resulted in the conviction of the death camp commandant Kaing Guek Eav and the ongoing Case 002 has cost about $200 million, which is actually on the low side of costs for international war crime tribunals. The Japanese and the Australians are contributing the bulk of the funding. But whether they, or anybody else, would be prepared to fund perhaps another five years because the tribunal’s scope had been widened to trial lesser acolytes like Meas Muth – with the bill being pushed closer to the $1 billion mark – is also another matter. The fact remains, this is a U.N.-backed hybrid tribunal and the Cambodians are the dominant partner with foreign funding. That may not be to everyone’s taste, but whether international prosecutors and judges, Western human rights groups and NGOs like it or not, any decision to expand the tribunal will ultimately need the support of the donors – and, most importantly, Cambodians.